It’s been an incredibly busy and super fun week for me. I was able to fly west to St. Louis to hang out with all my mascot buddies from around the league and to support Ryan Zimmerman, our very own all star! The week started off great as I joined Fredbird, Rangers Captain, Pirate Parrot and Stomper at the opening ceremonies of FanFest. Hall of Famer Ozzie Smith cut the ribbon to the entrance of the convention center, and the all star festivities were officially underway! 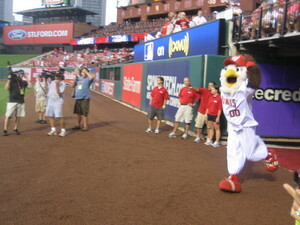 Soon after the opening ceremony, I participated in the mascot home run derby. I ended up hitting 11 home runs, but I didn’t end up advancing because the Pirate Parrot apparantly eats A LOT of wheaties! My 11 home runs ended up being the second highest home run total by any mascot the whole week. I was dissapointed to not advance, but I was pretty proud of my accomplishments. The next day I was able to visit a lot of patients at a Childrens Hospital in St. Louis. Visiting hospitals has always been one of my favorite activities. I made a lot of sick childrens’ days by spending my time in their room watching tv, playing with their toys, and stealing their food! 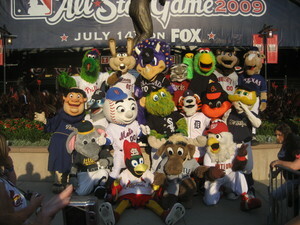 The following day, right after the MLB Futures game, I joined all my fellow mascots in a relay race on the field. I teamed up with Rangers Captain, Mr. Redlegs, Slider, and Slugger. The first leg of the race was the dizzy bat portion, followed by a hoola hoop contest, followed by a sack race. It was a dizzying experience but I finished with a great time. 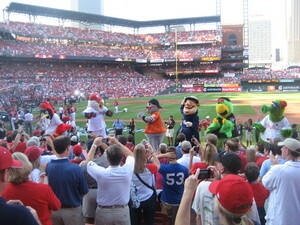 The team however let me down, and Fredbird’s team ended up winning. The next morning I helped kick off the MLB’s 5K and Fun Run. I thought about running in the race…..but only for a split second. I much preferred mingling and high fiving participants at the race start than running for a really really long time! The week was great fun and it was amazing to see all my buddies again at our yearly reunion. I’m already looking forward to the All Star game in Anaheim next year!